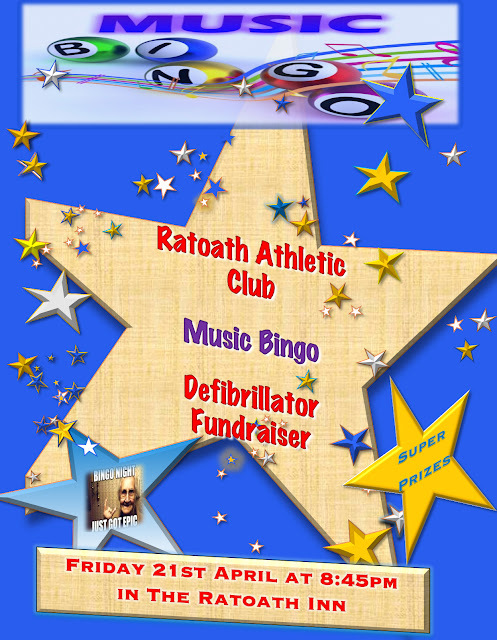 Ratoath Athletic Club: Club Fundraiser Music Bingo Tonight 8:45pm in the Ratoath Inn. Club Fundraiser Music Bingo Tonight 8:45pm in the Ratoath Inn. Bridal Shop - €100 voucher , Bridal Shop "Make up Application" Voucher, Meath School of Motoring Voucher for driving lesson, La Bucca €100 meal voucher, As you Like It €30 voucher, Venue Theatre €30 voucher, Elegance Hair Salon, St Pappins Rd - €30 voucher, Travel Advisors - 2 x €50 vouchers an lots more prizes... Thank you to everybody who donated so far.